This is the third of an initial series of 10 posts about Party Wall matters that are specific to London Mews. Each post is written with the Mews owner in mind, either as someone carrying out development works (referred to in the post as a ‘developer’) or as someone with development works occurring next door (referred to in the posts as a ‘neighbour’). 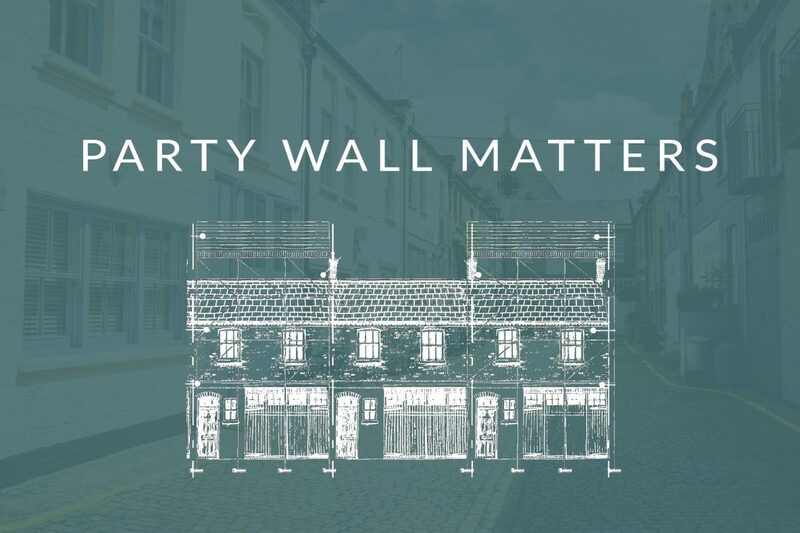 This post is the third of 3 that provide a general introduction to Party Wall legislation and explain the issues likely to affect either your or your neighbour’s Mews property. The remaining posts deal with Party Wall legislation and procedures, and their shortcomings, in more detail and they include typical Party Wall case studies and the related issues for Mews Owners and their neighbours. PHASE 1 – Mews refurbishment with internal alterations – Original Mews properties were not designed for modern living. In the nineteenth century there was no need for a multimedia room or sauna, or for his and her ensuites, or dressing rooms. Times change, however, and differing needs dictate new priorities and fashions. Accordingly, Mews properties can become subjected to a variety of alterations that cover a multitude of sins. The internal alterations can be as simple as re-jigging internal partitions to create a more open-plan look but could also mean a more complicated gutting of the property with subsequent re-building that could involve extensive alterations to the building’s structure, with the need for temporary support works to facilitate the changes. No matter how small a scheme of works, it should never be forgotten that a Mews is a simple structure, much weakened by the number of large openings it has. The front of a Mews is especially vulnerable as there may be one or more large openings at ground level (the old stable openings) where support is most likely to be needed. PHASE 2 – Mews Façade alterations and Roof Extension – more extensive alterations may require the Mews to be extended upwards. Although these are becoming rarer these days, since most roof extension opportunities have already been taken up, it is a lot cheaper to extend upwards than downwards. However, many planning authorities prize the low-lying appearances of Mews. If you receive notification that a neighbour proposes a roof extension it would be wise to initially consult your Local Authority’s planning portal to check whether the local authority encourages such development. If it is not allowed the development may be unlawful and there is no advantage to be gained in discussing it further. to their practicality in relation to the party wall structures needed to support the new roof. For example, has an assessment of the additional loading been made in relation to the foundations and if so will the foundations need strengthening? Such works will also need scaffold access which could impinge on the Mews and possibly the neighbouring properties. These and other associated matters will be dealt with in other posts. 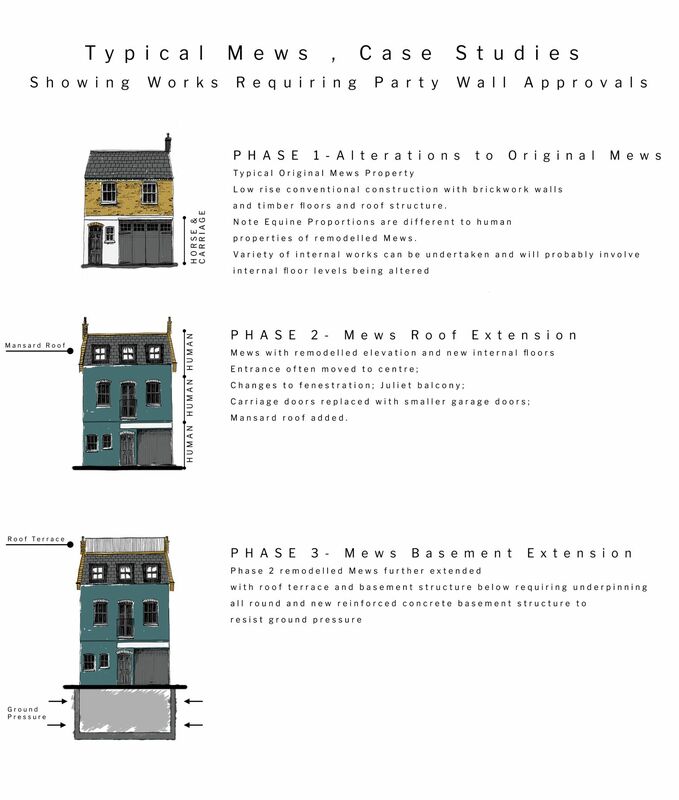 PHASE 3 – Mews Basement Extension – These are dreaded by most neighbours who worry about the possibility of long days of noise and disturbance blighting their quiet enjoyment of the Mews. Whilst the ‘golden days’ of basement development are probably behind us (the less regulated days when double and even triple depth basement digs were allowed) basement works are here to stay, although the attitudes of the local authorities and the estates have become hardened and chastened by their experiences. As is the case with roof extensions it is worth visiting the planning portal of the local authority in question to see what has been proposed and what is permitted. Likewise if you are on one of London’s Landed Estates it is worth calling them to see what they permit as Landlords or under any scheme of management they operate. Planners and other decision makers often interpret legislation in a way that can make basements seem unviable. But, more often than not, by slowing down the process they make such developments more considered and hence more viable. Ultimately, unless they can be fully prohibited, the market will decide and no amount of red tape is likely to hold back the wheels of commerce. Basement extensions bring their own unique problems to a development, as ground conditions come into play both in consideration of what is to be done under the property and in relation to the adjoining properties. London Mews are most likely to be on a clay soil (cohesive soil), but those towards the river could also be on gravel or sand (non-cohesive soil), both of which behave differently. Extensive site investigations will be needed to determine the soil types and the likely ground water effects beneath the Mews properties. After the design has been settled upon, the next problem is to manage the risks of the development which will doubtless last a year or more. Planning prompts an early consideration of the site traffic (a Traffic Management Plan) and a geotechnical appraisal needed for the engineer’s detail design. This in turn has to be interpreted by the contractors who take responsibility for the build. If the works are extensive the biggest consideration will be how to support the hollowed out remains of the property and the neighbours’ properties, whilst allowing room for the site operatives to carry out the works. The design of the temporary supports, props and struts is key to the speed, efficiency and safety of the works and the contractors’ approach to this will go a long way to ensuring the success of the build with regard to the neighbours and their surveyors, as well as commercially. Doubtless movement monitoring will be undertaken before, during and after the works with agreed monitoring trigger levels and protocols to prevent adjacent buildings having too great an exposure to vibration and other movements. provisions and prudent financial guarantees for the works. The risks need to be assessed and if there are particular concerns about the works or those undertaking the work then advice should be sought from the surveyors about security bonds and insurances to cover any potential problems. It is often prudent to have some of the developer’s funds to be placed into secure escrow accounts to cover the possibility of the development failing due to unforeseen circumstances. The money set aside in this way should be sufficient to allow others to complete and make the site safe if either the developer or the contractor fail to complete the works. Basement excavations in the Mews are often considered to be like icebergs and the issues associated with them can be considered on a similar scale. Having touched on them here by way of an introduction only they will be picked up and considered in more detail in the posts that follow.